Windstar Lines is proud to provide superior charter buses in Cedar Falls, IA. Windstar has locations and fleet options available near you to get you anywhere you want to go in the United States and Canada. Our Cedar Falls location allows us to provide top-notch, luxury motorcoach services to our customers here and throughout the state of Iowa. With the wide variety and large numbers in our bus rental fleet, we can accommodate any group of any size looking to travel. Windstar Lines is able to provide the right sized bus for your group or event. We offer travel solutions ranging from a 21 Passenger Minibus for airport shuttles and business trips, to a 56 Passenger Luxury Motorcoach for longer excursions. As one of the largest motor coach companies in the Midwest, we recognize the importance of a safe driving experience. All our drivers go through rigorous training, pass extensive background checks, and take ongoing training courses. We expect the most of our drivers because your safety and comfort is our top priority. Between 1950 and 1980, the City of Cedar Falls had one of the fastest growing municipal populations in the state of Iowa. This was spurred primarily by economic growth in the Metropolitan Area: namely John Deere and Company, Rath Packing, and Chamberlain Manufacturing all in Waterloo; a tremendous growth in UNI enrollment; and emphasis by civic leaders on quality of life factors in the community. Also during this time, and up to 1990, open enrollment of students and the Price Lab School at UNI were very important issues facing Cedar Falls. Source: Cedar Falls Official Website. 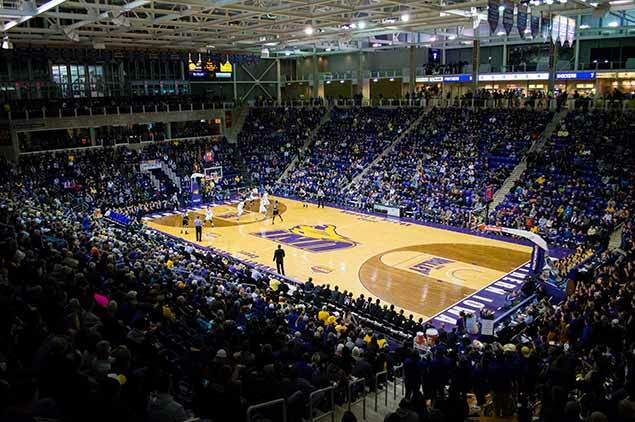 Cedar Falls takes great pride in its relationship with the University of Northern Iowa (UNI). There is a multitude of dining and leisure activities as well as cultural programs which makes Cedar Falls, Iowa a great tourist destination. If you're looking to travel to or from the Cedar Falls, Iowa area, be sure to visit the Cedar Falls Website to find other local amenities. Our reasonable bus rental prices are unbeatable for the quality services that we offer, and we will make your trip an experience to remember.